Bend Bucks starter Russ Miller threw a strong first three innings in this July 1990 game as he got some help from his defense, The Bend Bulletin wrote. Then came a Bend error, The Bulletin wrote, and Bend and Miller lost control. "After the error, they were just punching them through the hole," Miller told The Bulletin, "and that hurt me." Miller picked up his fifth loss on the season in that game, compared to only one win. He went on to go 1-6 overall for Bend that year. 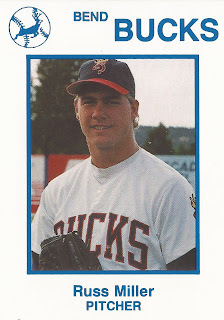 He did get a quick, four-game look at AAA Tacoma in 1990, but his stay in the pros lasted into one more season. He never got a look at the bigs. Miller's career began in 1989, taken by the Athletics in the 24th round of the draft out of Anderson University in South Carolina. Miller started with the Athletics in the rookie Arizona League. He went 4-3 there, with a 2.81 ERA. He also struck out 64 in 64 innings of work. He moved to Bend for 1990. He gave up four earned in a June no-decision, then three earned in another no decision that month. Overall, he went 1-6 with a 7.88 ERA at Bend. In his four games at AAA Tacoma, Miller saw 8.2 innings, but gave up eight earned. He also picked up a loss and one start. He returned to the field in 1991 at high-A Modesto, but only stayed briefly. He gave up 13 earned in six innings of work to end his career.